Who doesn’t love some yummy gingerbread on the Day of Giving? Certainly not this biscuit kacheek, who is the biggest gingerbread enthusiast in Neopia! This outfit has many wonderful colors in it and it all blends rather well. I love the background in particular, as you do not need to use a garland or foreground, it seems unnecessary. The moving Jinjah in this background adds to the overall effect of the outfit and it’s not only cute, but super fantastic as well! If you really wanted to add a little extra something to the effect of this customization, why not give your pet a Jinjah petpet? 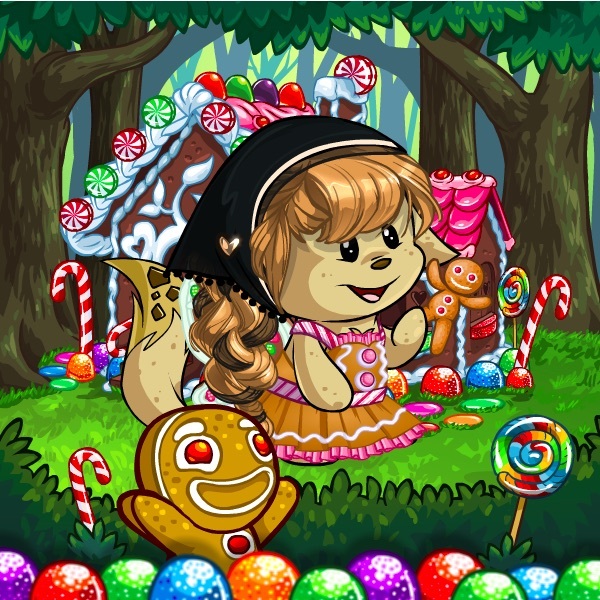 This outfit is made up of the following items: Handheld Iced Gingerbread Cookie, Gingerbread Party Frock, Gingerbread Dream House Background, Gingerbread Wings and Braided Candy Warrior Wig. A White Christmas is always on top of everyone’s wishlist, including mine! 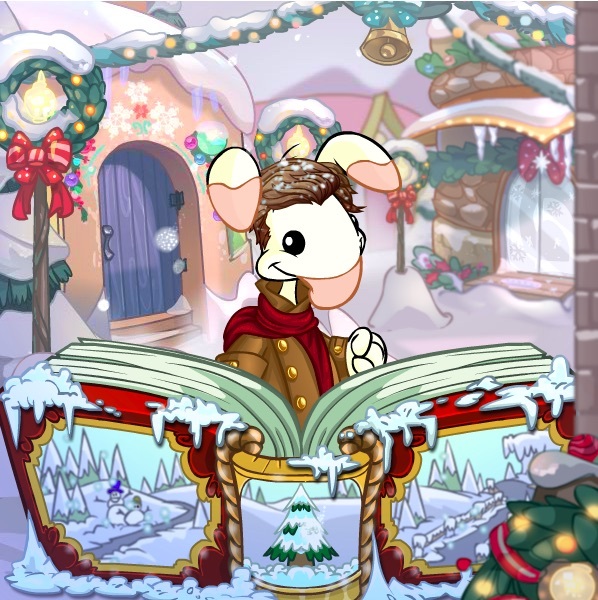 A White Aisha is the perfect pet for this customization and a snow theme fits in perfectly with the Day of Giving. Sit back, relax with a cup of Borovan and enjoy dressing up your pet in this wonderful snow theme. I particularly love this outfit, as Aisha’s are always fun to customize, and the colors work so well together. The wig I have chosen for this outfit also looks particularly fabulous on Aisha’s. Eerie Winter Snow Background has been my absolute favorite winter background for quite some time, as the animation and placement of the snow within it work so well. I don’t think this background will be topped any time soon. The Snowflake Shower provides the most magical light blue colored mist down the bottom of this outfit, so it balances out all the colors nicely. This outfit is made up of the following items: Eerie Winter Snow Background, Fuzzy Autumn Hat and Wig, Prissy Miss Snowflake Dress, Snow Covered Bridge and Snowflake Shower. All of these items are favorites of mine. 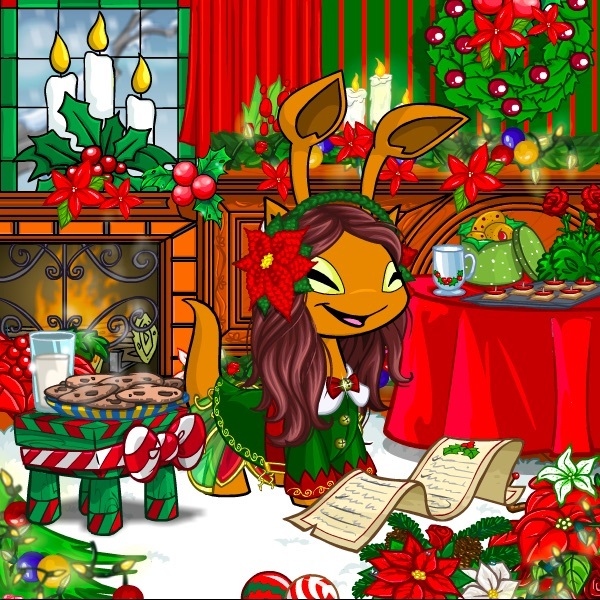 A young Christmas Aisha is waiting for her gifts on the Day of Giving in this themed outfit! It was very fun to put together. The Holiday Party Background has so much going on, it is so entertaining to watch! Cookies, candles, a roaring fireplace and lovely poinsettia flowers feature in this background. The brown, green and red colors of this outfit work very well together and show the true Christmas spirit! As mentioned above, Aisha’s work particularly well with many of the items featured in this article. The Christmas base color of this Aisha in this outfit blends nicely with the rest of the colors making up the background. This outfit is made up of the following items: Cheery Holiday Dress, Crocheted Ear Muffs and Wig, Holiday Helper Coat with Tails, Holiday Party Background, Holiday Shopping List (NP item) and Table of Holiday Treats. This young Blumaroo is out singing for the Day of Giving. Hooray! He looks rather dashing in his warm coat and scarf. The Shopping in Neopia Central Background is such a wonderful background to use for this Day of Giving theme, as it has so many amazing colors working at once, in addition to the falling snow that helps to complete this outfit. There are also moving bells and beautiful lights. This outfit is pretty simple in terms of items, as there are only 4 used. The Carolling Songbook Foreground used in this outfit also has an element of movement of turning pages, which adds to the overall effect the outfit has. This outfit is made up of the following items: Carolling Coat and Scarf, Carolling Songbook Foreground, Shopping in Neopia Central Background and Snow Covered Boy Hair Wig. Ahh the classic Snowman, can’t forget him! This cutie is a Snow Chia, which is the perfect pet for the Snowman outfit. 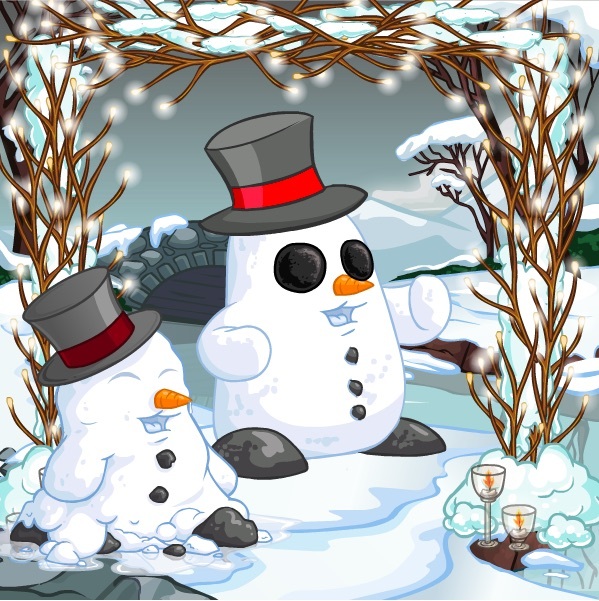 Many of the snowman theme items are based off the design of the Snow Chia, so it works very well together. He has a cute carrot nose and coal buttons (Olaf is that you?). It was simply wonderful to make. I am sure you will have fun with this one too. Not only does his snow color blend well with other items, but it suits the overall snowman and Christmas themes. This outfit is made up of the following items: Arch of Winter Garland, Coal Contacts, Gloomy Winter Day Background, Partially Melted Snowman and Snow Chia Top Hat (NP Paint Brush Item). Who doesn’t love the red and white Christmas lolly?? Yum yum. 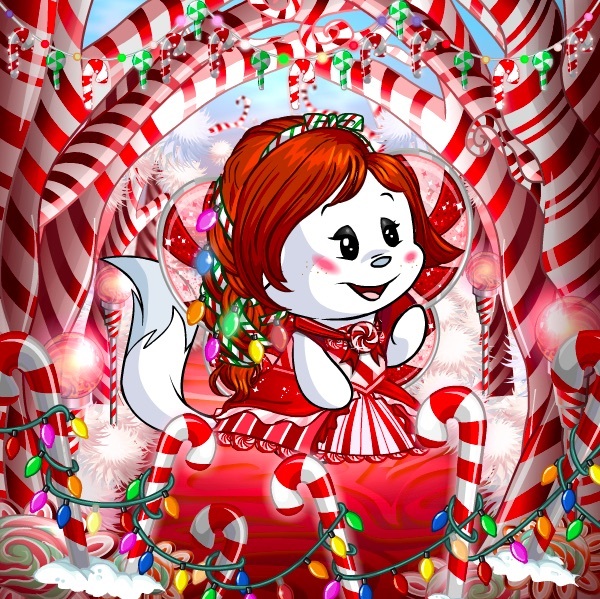 This White Kacheek is definitely the Candy Cane’s greatest and most loyal fan. This outfit was very easy to put together! I love the garland and foreground items, as they bring an element of movement and changing colors to the entire outfit, without disrupting the other items. Each item in this outfit was chosen to blend well, and give a nice even look overall. I can’t quite pick a favorite item from this outfit, as I think they all work so well together. This outfit features 1 Neopoint item. This outfit is made up of the following items: Black Eye Shadow (NP item), Candy Cane Lights, Candy Cane String Lights, Candy Cane Wings, Holiday Striped Path Background, Limited Edition- Holiday String Lights Wig, Peppermint Candy Necklace, Peppermint Queen Dress and Rosy Cheeks Face Paint. Thank you so much for reading this article. I hope I have given you some sort of inspiration regarding Christmas themed outfits for the Day of Giving this year. Feel free to mail any questions or suggestions! Enjoy the Day of Giving both online and offline. Happy Christmas! !